This is an issue of the British Music magazine New Musical Express from Friday, July 16, 1965, featuring an article on the Hollies at home. It's called "The Hollies at Home." The photos were taken by Napier Russell. If the print is hard to see, let me know and I'll type everything out. P.S. Thanks for setting this up, Rob! Vrinda, thanks for this priceless clipping! Silly sausage, eh? I think I remember reading somewhere that a few years later, Allan and Jenny lived in an actual castle for awhile, but that didn't last too long because although it was a romantic notion, the reality was quite uncomfortable. You're welcome, Snowflake! I can only imagine the headaches with living in a real castle - the cleaning, the upkeep. Did Jenny do all that herself? I doubt it. It would be too much for one person to do, and by then, Allan could have probably afforded hired help. This does bring another question to mind, one which I'm sure no one here might know the answer to, but I'll throw it out anyway: Did Jenny work when she and Allan first got married? She strikes me as a schoolteacher type. Don't ask me why, it's just some inclination I get when I see a person. Yes, that nickname of Allan's ... where did she think it up?! "Jennifer's Castle, oh what a hassle", so to speak. I guess they substituted Eleanor for Jennifer so no one would see the real inspiration! 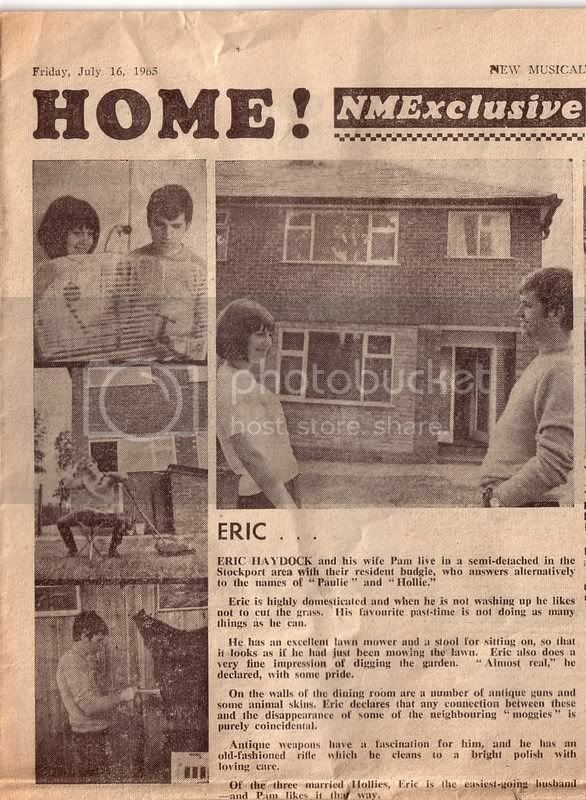 Wow, Eric's wife was a cutie! And just to confirm this, all those locations listed above were still in the Manchester area, correct? None of the Hollies had relocated their permanent homes to the London area for ease of recording at the studios, correct? Help me out, please - back then, how long would it have taken to drive an automobile from Manchester to the Abbey Road studios? And how many miles (please, no metric system measuremetns for this dumb American) would that be, anyway? 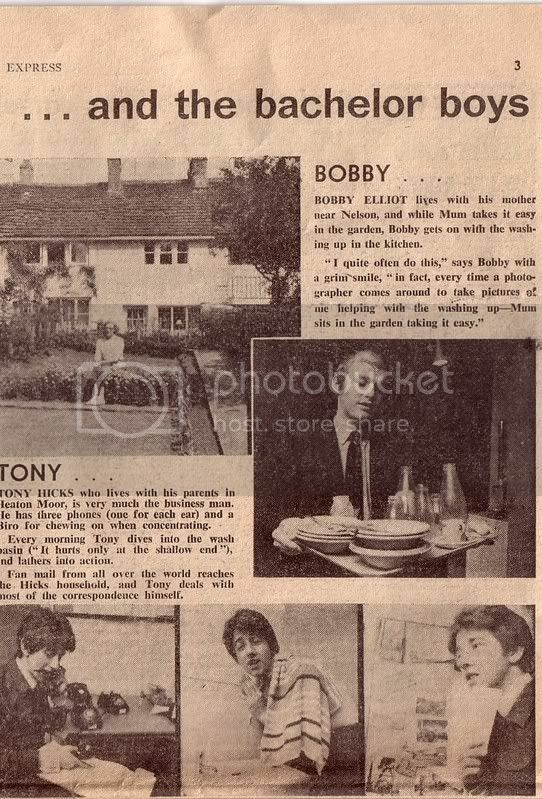 These are great, poor old Bobby, do you think he's still washing the dishes? Allan, Graham and Eric were all married young, Eric's wife is sure a good looker. Thanks, Anthony, and you're welcome. Yes, Allan, Graham, and Eric all married young, probably around 21-22. I couldn't imagine getting married at that age. In today's world, it does seem very young. I wonder if Bobby is still doing the dishes, too. If they're still coming to his house to take pictures, there's a good chance he's still scrubbing, washing, and drying! Stockport is 10 miles southest of Manchester, and about 150 miles northwest of London, so it suffices to say that Allan, Graham, Eric, Tony, and Bobby did not make the commute every single day to London. Styal, Nelson, and Heaton Moor don't show up on my map of Great Britain, so maybe they're in Manchester itself. Maybe someone here knows and can shed light on this. Isn't Bobby married to Tony's sister? I've heard that more than once, but don't know for sure. Post subject: Find Me a Family..../Too young to be married ? Yes ,Tony and Bobby are brothers in law...and in Music too ! 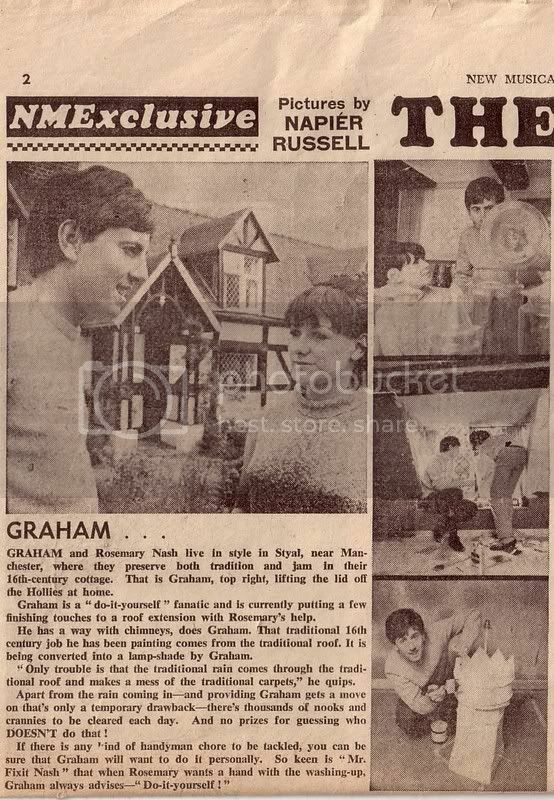 whatever happened to Graham's first wife Rosemary (Nee Eccles !) ? Did you also mean that Jenny was a model, too? Was she a fashion model? Did she appear in any ads or commercials? I don't know what happened to Rosemary Nash, but I think Graham left her around the time he decided to leave the Hollies. P.S. Does anyone think Jenny is wearing a wig in those pictures? Somehow, her hair looks very stiff and unnatural to me in these. Post subject: Was it Allan Clarke....? ...Now I see, on reading the press cutting posted above it does say Allan DID indeed have two dogs...! That's a cute story, Geoff! I think women change their hairstyles so often to suit their current mood or personality, or to show their physical versatility. Maybe I thought Jenny's hair wasn't her own as it was a very bright blonde color, one I usually see on wigs or women who dye their hair. When exactly did your co-worker see Allan - in the sixties, or seventies? Did she say what type of dogs they were? If they were dachsunds, and if Allan ever broke his arm at any time then, then either we have quite a coincidence here, or that man she saw really was Allan! Jenny looks like she might have been a model. She had some of the features that were popular in the modeling world at that time. There is so little information out there on the Hollies' wives, unlike the Beatles' or Rolling Stones' wives and girlfriends, that you have to search high and low to find out these things. I thought Allan and Jenny were old schoolmates, or at least knew each other as children. That was something that came to mind when I read that article and saw those pictures.